Do you have an office job and have to spend half of your day sitting down on a chair? Have you been experiencing some backache lately? If so, then you need an office chair that is perfect for you and can adjust to your needs. 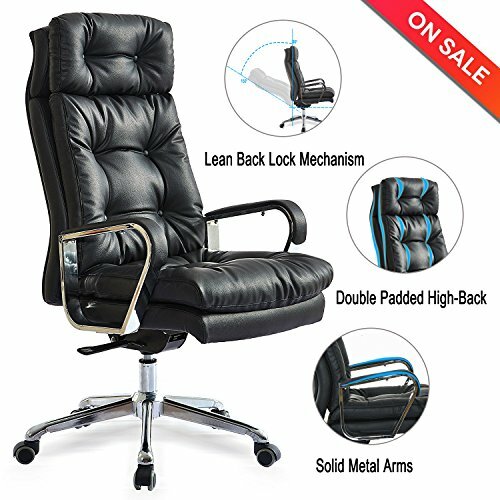 What you need is the new high back executive chair! Forget about the office chairs that are stiff and uncomfortable and too tall or short for you. This amazing new office chair can be adjusted any way you need to for perfect results. You can easily and quickly adjust the height of the chair as well as the recline angle. The chair has a unique angle recline locking mechanism so you can easily keep the back of the chair securely and steadily on the angle you prefer. We make sure that we make our products with the best quality materials and with special attention to detail so you can have only the very best. The executive chair is made with PU leather that is not only stylish and elegant, it's also very strong and comfortable too. The chair has extra-soft padding so you will never feel discomfort or pain in your chair. And no need to worry about decreased mobility either. The high back chair has a heavy duty nylon base and nylon rolling casters for smooth movement and stability. The chair can withstand up to 250 pounds for best results and it is very easy to assemble and set up. If you have any questions about this product by Lifang, contact us by completing and submitting the form below. If you are looking for a specif part number, please include it with your message.